2nd AMTSO Real Time Threat List (RTTL) based certification test. Testers looking at the efficacy of Anti-Malware products use the samples to validate their own collected samples that they test with to check for prevalence to ensure that what they are testing with are real world examples that threaten users a businesses. Academics researching or analysing trends in the Anti-malware industry can also use the RTTL to allow them to have a rich data source to work from. 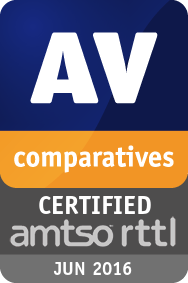 AV-Comparatives used their Real-World Protection Framework to execute those 299 samples. Each sample was executed simultaneously under Windows 7 SP1 64bit with the respective security product installed to see if it is detected and blocked. The security products used default settings and had full-Internet (cloud) access. For this test, we included publicly available endpoint security products of current AMTSO members. The Top500 samples (tagged as “malware” in RTTL) for the month of June 2016 were queried and tested on the 27th June 2016. As the RTTL contains currently also misclassified clean and PUA files, we took only those samples which showed malicious behaviour in our sandboxes. At the end, 299 malicious samples remained and were taken for the test. 29 products have been put to the test. A protection rate over 98% is required to get certified.